The high-scoring shooting guard, who was part of the Smart-Gilas 2.0 squad earlier this year, scored just 10 points on a miserable 1-of-8 shooting from the floor against the Petron Blaze Boosters yesterday. In this conference we’ve seen his play nosedive, which is strange when one considers his career-defining 2011-2012 season. Last year, David averaged nearly 26.0 points per outing and made a career-best 3.0 triples per match in 49 games for Powerade. Now he has started really slowly, norming 10 points fewer than last year and making good on just 21% of his three-point tries. 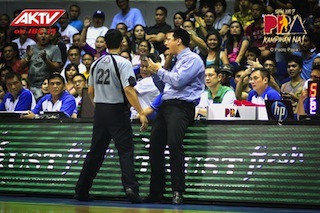 Global Port team manager BJ Manalo had something say about the bewildering dip in David’s play. “Dito mo makikita yung pagiging tao nila na somehow na-apektuhan din sila sa mga ganitong balita,” said Manalo. big three-team trade is about to happen. Ganitong balita refers to swirling rumors that the “new” franchise is looking at the possibility of trading its cornerstone player. The most persistent trade gossip revolves around David playing musical chairs with Petron’s Jay Washington and Ginebra’s Kerby Raymundo. If indeed something like that takes place, David understands why. “Kung ma-trade man ako, ready lang ako mag-adapt sa bagong sistema. Ganyan lang talaga ang buhay sa PBA. Tanggapin na lang natin yung ganun kasi trabaho iyan eh,” said David. Of course, the Batang Pier management are not keen on entertaining such thoughts, or so they say. “On our side, wala kaming balak talagang i-trade si Gary. 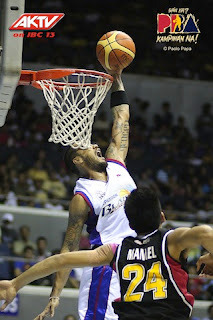 We intend on keeping him and build the team around him,” said Global Port Head for Basketball Operations Erick Arejola. With many sides airing differing comments, it seems like we will all just have to wait how this telenovela-ish series of events unfolds. All the best, of course, to El Granada Gary David. Up against a rejuvenated Air 21 squad, Rain or Shine turned to defense to get back to its winning ways. The Elasto Painters put the clamps on the fast-paced, high-scoring Express to win, 71-62, in the PBA Philippine Cup’s road game at the Mindanao Civic Center in Tubod, Lanao del Norte. “We expected a hard game becuase they were coming from a winning momentum, so we just played a lot better defense today than our last game against petron. 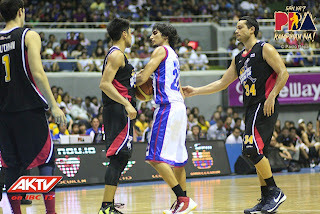 We resolved to bring back our defensive intensity for this game,” said Rain or Shine coach Yeng Guiao. The Express on a three-game winning run heading into the game, a streak anchored on their balanced scoring. But against the Elasto Painters, they had to bleed for every point. 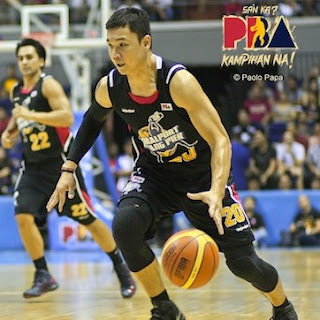 “We know Mike Cortez and KG Canaleta were their key guys and I have to give credit to the people who matched up against them, sina (Ronnie) Matias, sina Gabe (Norwood) and even si Chito Jaime for the few minutes I used him he did a really good job,” said Guiao. Jaime, a rarely-used wingman, was instrumental even on offense as he touched off his team’s 7-0 spurt that gave the Elasto Painters a 61-49 lead early in the fourth period just as Air 21 was threatening to make it a close contest. 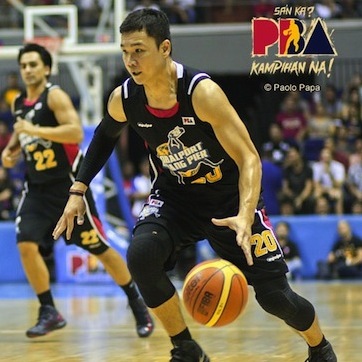 Jeff Chan paced the Elasto Painters with 15 points while Beau Belga and Jervy Cruz added 10 apiece. Canaleta led all scorers with 18 points followed by Mark Isip’s 12, but Cortez struggled for just 11. ROS 71 – Chan 15, Belga 10, Cruz 10, Norwood 9, Rodriguez 8, Quinahan 5, Arana 4, Jaime 3, Matias 3, Ibanes 2, Tang 2, Uyloan 0. A21 62 – Canaleta 18, Isip 12, Cortez 11, Wilson 6, Custodio 6, Baclao 4, Sena 2, Ritualo 2, Reyes 1, Omolon 0, Arboleda 0. Petron Blaze’s guns were blazing on Sunday and notched an easy 110-81 win over a listless GlobalPort squad for its second straight win in the 2013 PBA Philippine Cup at the SMART-Araneta Coliseum. The Boosters jumped the gun early on Batang Pier and never looked back after a scintillating start to improve their mark to 5-6. Chris Lutz had 22 points, six rebounds and six assists to lead Petron while Arwind Santos added 20 points and 13 rebounds. June Mar Fajardo returned from injury and collected 14 points and seven rebounds in 25 minutes. “It’s a combination of a lot of things. We caught GlobalPort on its worst game of the season. Nagkataon rin suwerte offensively,” said Petron coach Olsen Racela who also drew 10 points each from Jay Washington and Marcio Lassiter. 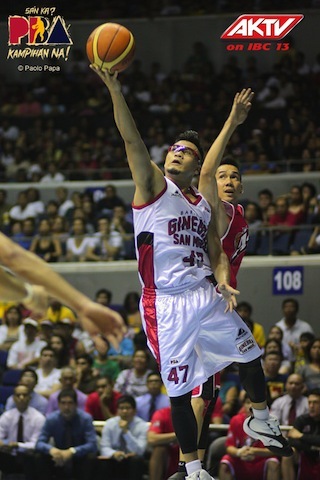 “I really expect a close fight especially Gary David coming off a 21-point fourth quarter. I’m surprise with the big margin,” he added. Behind Santos’ double-double (14 points, 10 rebounds) output in the first half, the Boosters erected a 58-34 spread while shooting 55.6 percent from the field (20-of-36). Their lead reached as high as 32 points, the last one at 97-65 on Washington’s alley-hoop slam off Alex Cabagnot’s pass midway in the fourth period. Rey Guevarra paced Batang Pier with 14 points while David and Josh Vanlangdingham had 10 apiece for the erratic Batang Pier, who dropped to 1-9. Coach Glen Capacio’s team has now lost its last six outings. Two-time MVP Willie Miller had only six points in 18 minutes and was sparingly used in the second half. PET 110 – Lutz 22, Santos 20, Fajardo 14, Lassiter 10, Washington 10, Mallari 6, Duncil 6, Yeo 5, Cabagnot 5, Faundo 4, Lanete 4, Miranda 4. GLO 81 – Guevarra 14, Vanlandingham 10, David 10, Mandani 8, Lingganay 6, Miller 6, Manuel 5, Al-Hussaini 5, Salvador 5, Antonio 5, Yee 4, Deutchman 3, Vergara 0, Adducul 0. QS: 27-15, 58-34, 81-53, 110-81.
as Petron beat Global Port. On the eve of his birthday, reigning PBA Most Valuable Player Mark Caguioa scored 24 points, including the marginal baskets, to gift Barangay Ginebra San Miguel with a pulsating 96-93 victory over Alaska Sunday at the SMART-Araneta Coliseum. Caguioa’s floater 43.4 seconds left gave the Gin Kings the lead for good. Alaska had a chance to tie the game, but JVee Casio turned the ball over. 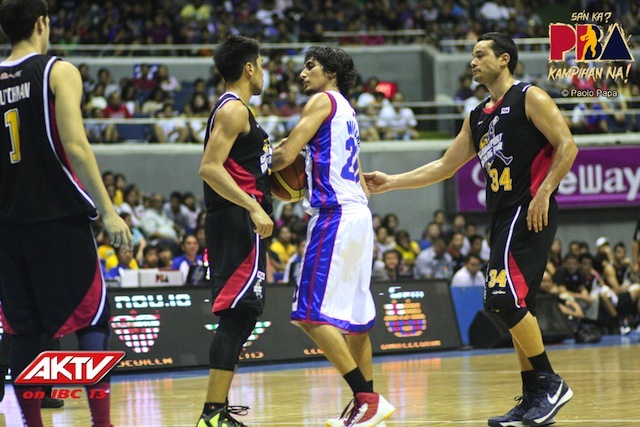 Alaska opted not to foul in the ensuing possession, allowing LA Tenorio to put up a three-pointer. 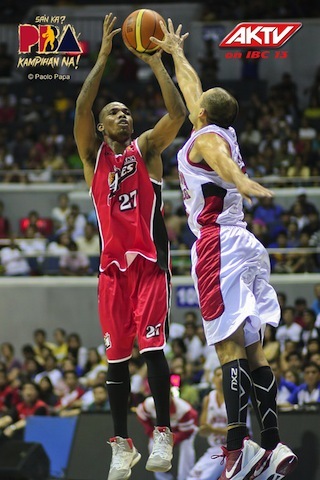 But Ginebra managed to grab the rebound off Tenorio’s miss, forcing Alaska to foul Caguioa with four seconds left. The hotshot shooting guard split his free throws, but Alaska once again failed to clear the rebound with just a second left. Ginebra inbounded the ball to seal the victory, the Gin Kings’ third straight after five losses. Billy Mamaril had his best scoring game in the last four seasons with 16 points to go along with his 12 rebounds, as well as a crucial save in the dying seconds to keep the ball alive for Ginebra. “I think we’re lucky we’re able to sneak out this win. Pahirapan talaga,” said Kings coach Siot Tanquingcen. It was a sorry loss for the Aces, who led 80-72 in the fourth quarter on RJ Jazul’s three-pointer. They last took a 93-91 lead on Mac Baracael’s jumper with 1:21 remaining. Mamaril then tipped in Willy Wilson’s attempt to tie the count at 93-all, before Casio committed two straight turnovers to set up Caguioa’s heroics. Baracael finished with a team-high 21 points for the Aces, who missed the services of rookie Calvin Abueva due to sickness. Casio added 16 points but was held scoreless in the fourth period as Tanquingcen put the taller Ellis on the Alaska court general. The victory moved Ginebra back to .500 with a 5-5 win-loss slate. Alaska lost its fourth straight match for a 5-6 card. Caguioa, who turns 33 on Monday, dedicated the game to Ginebra fans, specially those who put together a celebration for him last Saturday. GIN 96 – Caguioa 24, Mamaril 16, Ellis 12, Tenorio 10, Espiritu 9, Maierhofer 8, Wilson 6, Hatfield 4, Taha 3, Labagala 2, Helterbrand 2. ALA 93 – Baracael 21, Casio 16, Jazul 10, Espinas 10, Thoss 10, Baguio 9, Hontiveros 7, Eman 6, Reyes 2, Dela Cruz 2, Belasco 0. Aces lost to the Gin Kings. discrepancy in the final frame.